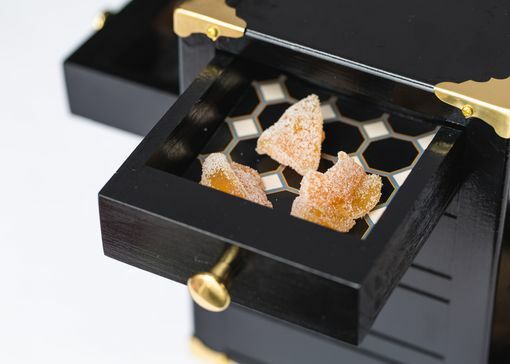 After being contacted by a representative of Del Posto Restaurant in New York City, owned by Mario Batali of "Iron Chef" fame, an agreement was reached to make a prototype of a Dessert Valet Box that is currently in use @ the restaurant. All necessary sizes, style, hardware, color, & functionality were agreed upon; & the prototype was made & shipped to be used & critiqued by the restaurant staff. 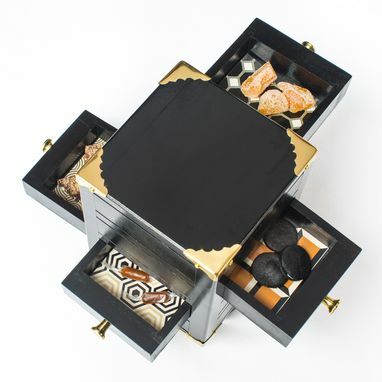 After using the prototype @ Del Posto Restaurant, the only change that was recommended was that a large brass hoop/ring be added to the top of the Dessert Valet Box to make it easier for the servers to carry & set down the Boxes on the tables. 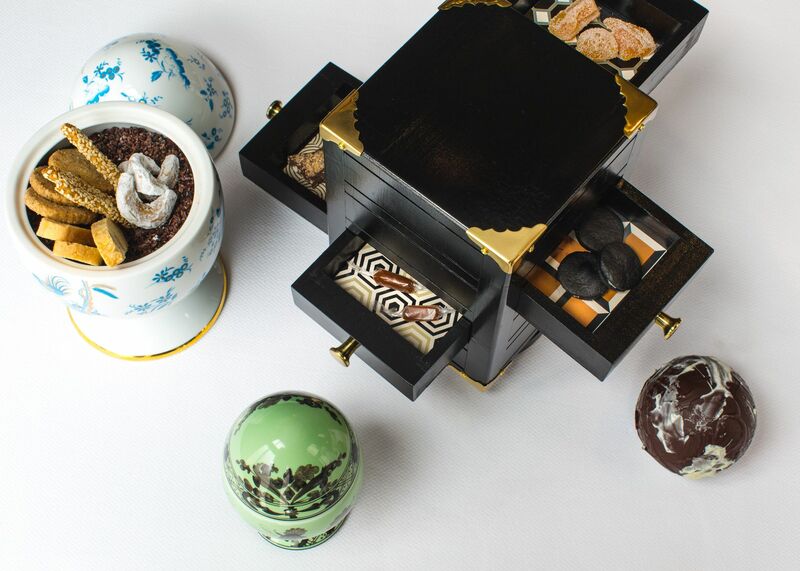 The restaurant then ordered a dozen of the Dessert Valet Boxes & production commenced. After the Boxes were completed, they were carefully wrapped & packaged for shipment, which occurred ahead of schedule. 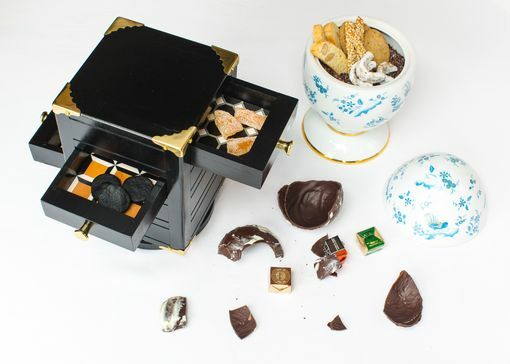 Each Dessert Valet Box is approximately 5-1/2" square x 8" tall. 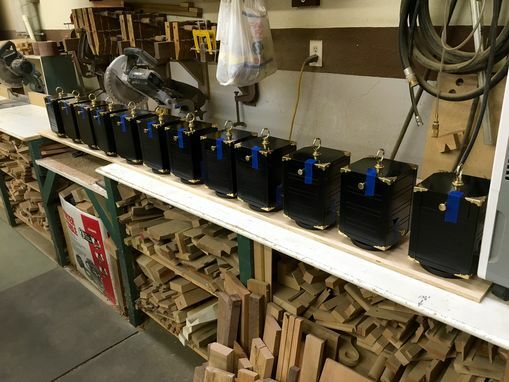 Each Box sits on a turntable, which allows a customer to rotate the Box to access each individual drawer on all 4 sides. Del Posto Restaurant pastry chefs fill each drawer of the Box with different bite-size delicacies, or as explained by the Head Pastry Chef,..."the dessert after the main dessert!" 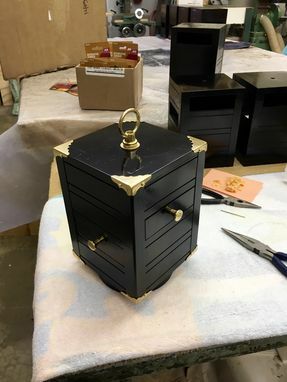 Brass corners & brass drawer pulls accent the gloss black finish of each Dessert Valet Box.